We tried the size Medium in this jacket on Huey and we put an XL jacket on Dewey. These are the sizes they normally wear and both fit great. My advice would be to wear the size you normally wear in men’s clothing. If you look at Icon’s chest size estimates for each jacket, you might be choosing a size larger than you normally wear (example a person with a 46 chest typically is an XL, but using Icon’s chart you’d buy an XXL), but we think the jackets fit more like what you’d expect in men’s clothing. If you want to choose a jacket based upon your chest and belly size, I’ve put together the chart below. I’ve included Icon’t suggested chest size ranges and I’ve added a column to give you our estimate of max chest and belly size for each jacket size. If you prefer a loose fit, then Icon’s estimates would be appropriate. Contrary to Icon’s marketing info which says this jacket has an “Icon Sport Fit”, I find the taper from chest to waist to be pretty “relaxed” and therefore belly size won’t be a problem for most. But if you have a bit of a belly, you’ll want to get a measurement and make sure to choose a jacket large enough to work for both your chest AND belly..
Wow, just look at this new TiMax jacket! This is about the most agressive, masculine style jacket I’ve seen in a while. 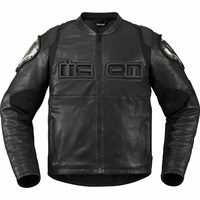 And its not just show, but rather this is a truly high quality, well engineered jacket that will give you tons of impact and abrastion protection for motorcycling. The shell of this jacket is largely black leather with perforations in key areas to breathe in warmer weather use. And then there are panels of black stretch materials in key areas to make a sport fit jacket like this work. The stretch is along the sides of the torso, where the arms meet the shoulders, above the elbow and up and down the insides of the arms. The jacket fits well and moves easily which is saying something considering the robust materials used here. The armor packet will be all you need. The jacket is fitted with D3O CE rated armor in the elbows, shoulders and back. D3O is top of line and is comfortable too. Notice the textile material on the elbows and all down the back. That material is a TOUGH blend of ballistic nylon with tiny titanium threads woven in. I really don’t think the titanium threads have a function because the nylon material is PLENTY beefy for protection purposes, but it makes for a good story and give those panels a bit of “sparkle” from different angles. And lastly, and this goes without saying, there are the titanium panels on the shoulders and back. Those armor pieces are expertly installed on the jacket with sharp rolled leather borders. They look good and that rolled leather might help you not knock those guys up against stuff you’d otherwise not want to scratch. Overall, I found the fit of this jacket to be just great… it will work for a wide range of body types and even though it has a decidedly sport cut, people with sturdier builds should be able to wear this jacket comfortably too. I mentioned that parts of the leather chassis are perforated which will flow some air. Also, the big ICON rubber letters in front have mesh material behind, so those will flow air too. The jacket comes with a removable thermal vest you can use in cooler weather. Overall, I’d say this jacket will work for cooler to warmer weather and would also go down in temps if you layer under it. It probably won’t be too comfortable in hot weather though just because black leather sun don’t play nice together. Icon says: Our legends are forever. They live on in tales of asphalt entanglements and high-speed encounters. After years of constant begging and pleading from the masses, the legend returns. From the ICON lab in the rain-soaked ruins of Slabtown, the TiMax jacket has been reborn. This incarnation features a perforated leather chassis coupled with titanium-reinforced textile shoulders and back. The sport fit remains refined yet aggressive, and the full D3O® impact protector package (elbow, shoulder, back) with the removable insulated SatinCore vest liner keeps you comfortable and secure in almost any condition. Our memories took us to the past; the TiMax will take us to the future.